Once a business has established itself stateside, very often it will begin to explore the possibilities of expanding. “Going global” is no easy undertaking, but the benefits it brings to your business are ones you are going to want sooner rather than later. Read on to find out more about taking your business global and how international shipping logistics can help facilitate this transition. What Does My Company Get Out of Going Global? …you’ll remain a top competitor. Your company may be doing exceptionally well as-is, but if a comparable business offers international products or services and you do not, then you will soon fall behind. A logistics company that can help you ship internationally on-time and on-budget will keep you in front of the pack in the hectic business world. ..you’ll never run out of customers/clients. As you establish your client connections in the U.S., there comes a certain point where you’ve reached the largest amount of people who are in need of your services. 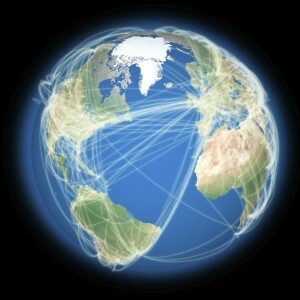 By going global, you will be able to avoid the dreaded business plateau and continue to grow by reaching new markets. …your revenue will increase impressively. More clients mean more profits in the long run, and so by reaching out to foreign markets you boost your chances of making money. Your international shipping logistics will more than pay off with this additional source of income. International shipping logistics, when handled by the right logistics company, make it easier to go global than ever before. Get in touch with AFP Global Logistics today to find out more about your international shipping options. If you’d like to work with a logistics company that will put the needs of your business first and foremost, AFP Global Logistics is the best and only choice! With 25 years of experience in the logistics industry, we are equipped to create and implement provide a full range of shipping services. Get in touch with AFP today to learn more or to start designing your custom logistics handling experience. Give us a call at 410.590.1234 (toll-free 800.274.1237), email us at info@afplus.com, or fill out our quick and easy contact form here! This entry was posted on Wednesday, May 6th, 2015	at 3:38 pm	and is filed under International Shipping, News	. You can follow any responses to this entry through the RSS 2.0	feed. You can skip to the end and leave a response. Pinging is currently not allowed.